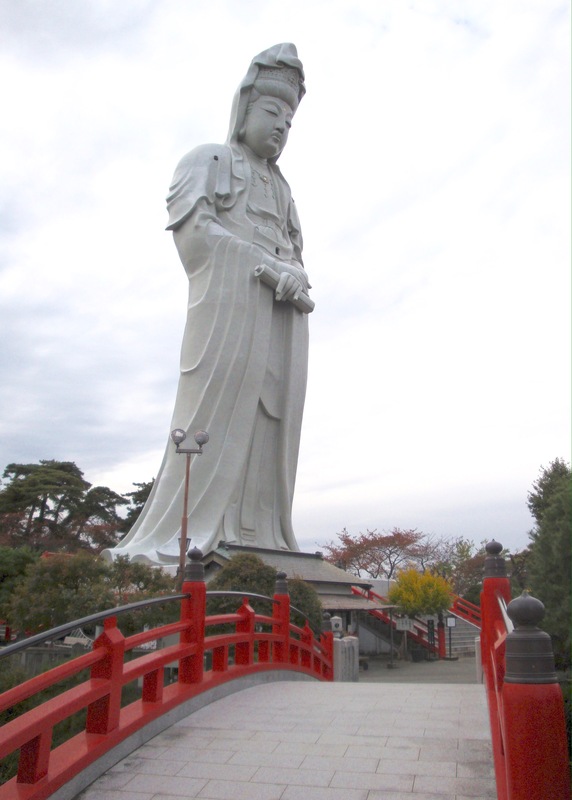 There are two main types of giant Buddhist statues in Japan, Daibutsu (Giant Buddha) and Dai-Kannon (Giant Goddess of Mercy). Older statues are made of bronze or stone. Newer ones tower over local landscapes, are made of reinforced concrete, and can be explored – internally. Five impressive ‘ascendable’ statues surround Tokyo and all are worth visiting. My top choice can be ascended by elevator, the other four have staircases to climb. Most can be reached on a day trip; only one (#3) requires an overnight stay. Built in 1993, the Ushiku Daibutsu is, by far, the best ascendable giant Buddhist statue in the Tokyo area, and perhaps in all of Japan. 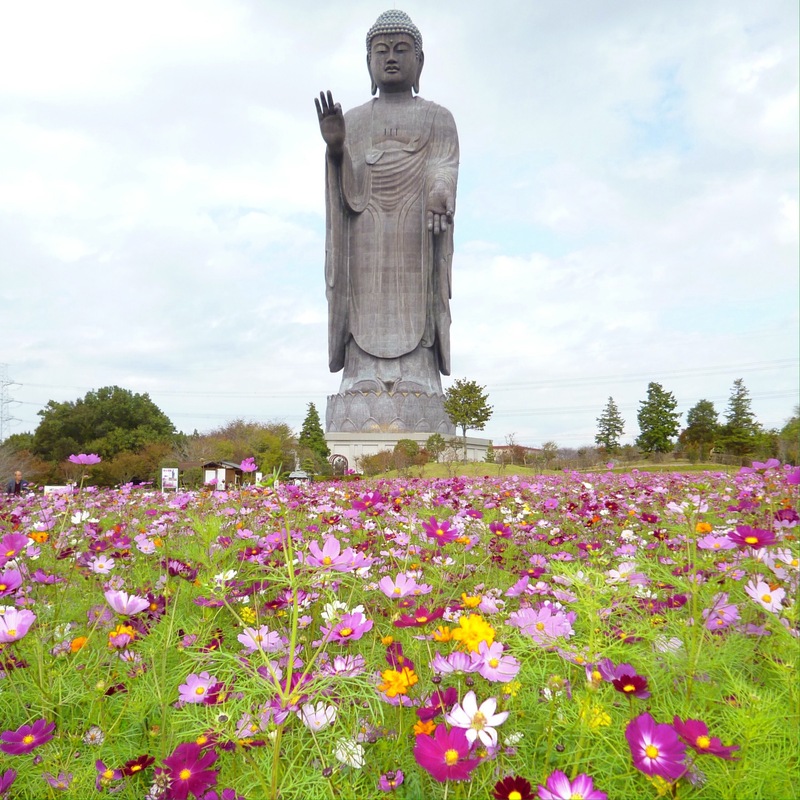 As of 2016, this giant Buddha was the 3rd tallest in the world at 120 meters (390 feet), including its lotus platform & base. There are a number of reasons the Ushiku Daibutsu is special: it is covered in bronze, the interior is half museum & half sacred space, visitors can travel by elevator 85 meters (279 feet) to an observation floor, and the Daibutsu is surrounded by a lovely garden that changes with the seasons. Unlike the other statues on this list, the Ushiku Daibutsu is a great choice for the elderly and those with small children. The statue is a 30 minute bus ride from Ushiku Station. 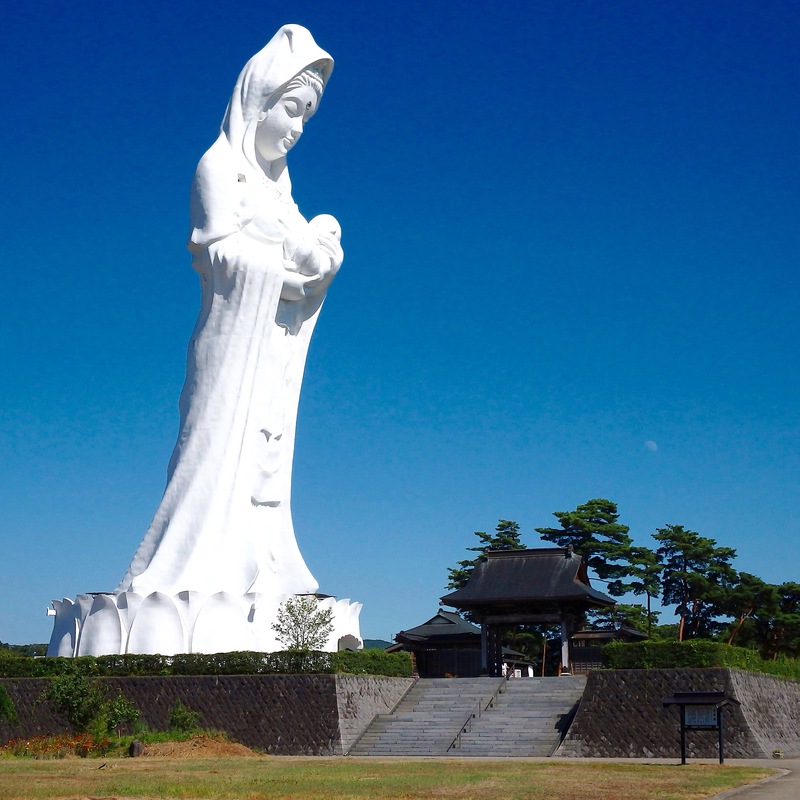 The Tokyo-wan Kannon is a 56 meter tall (184 feet) Goddess of Mercy in Chiba that stands on a hillside overlooking Tokyo Bay. She was built in 1961 and visitors must climb up 324 steps to reach the small room in her head. 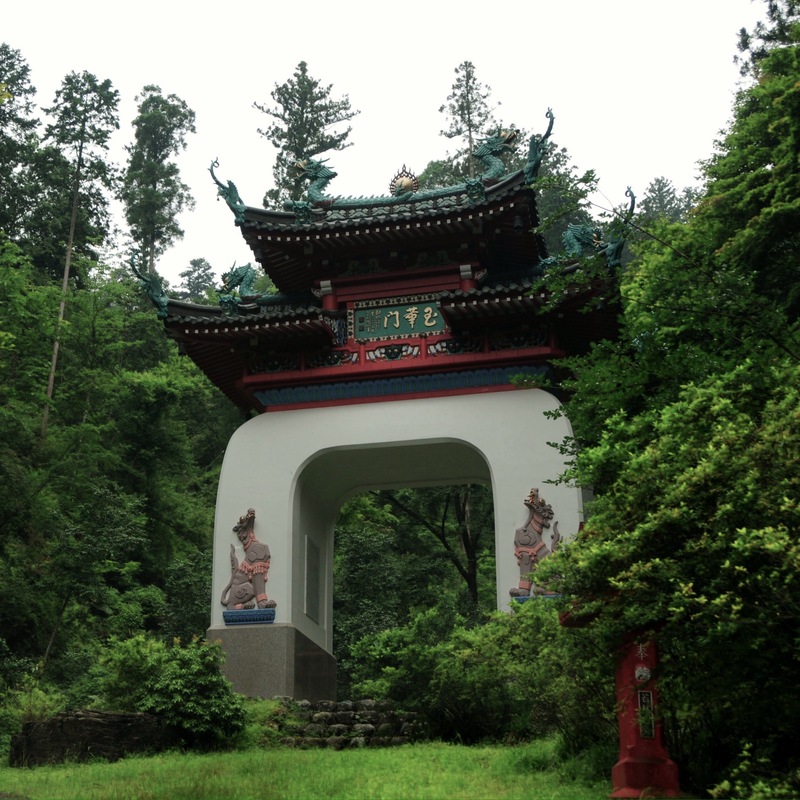 Along the way there are tiny viewing windows and lovely wooden Buddhist sculptures on display. Best of all, there are a couple of platforms where one can go outside, into a wire cage, for a breathtaking view. 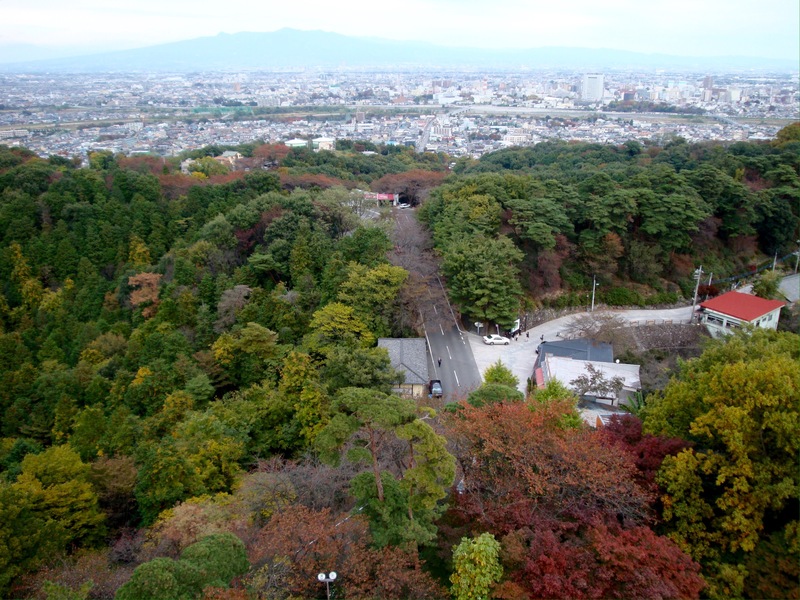 The Tokyo-wan Kannon is a short taxi ride, or a 40 minutes walk, from Sanukumachi Station. Although technically not in ‘the Tokyo area’, the Aizu Jibo Dai-Kannon is beautiful and in such a lovely location that it deserves a visit. 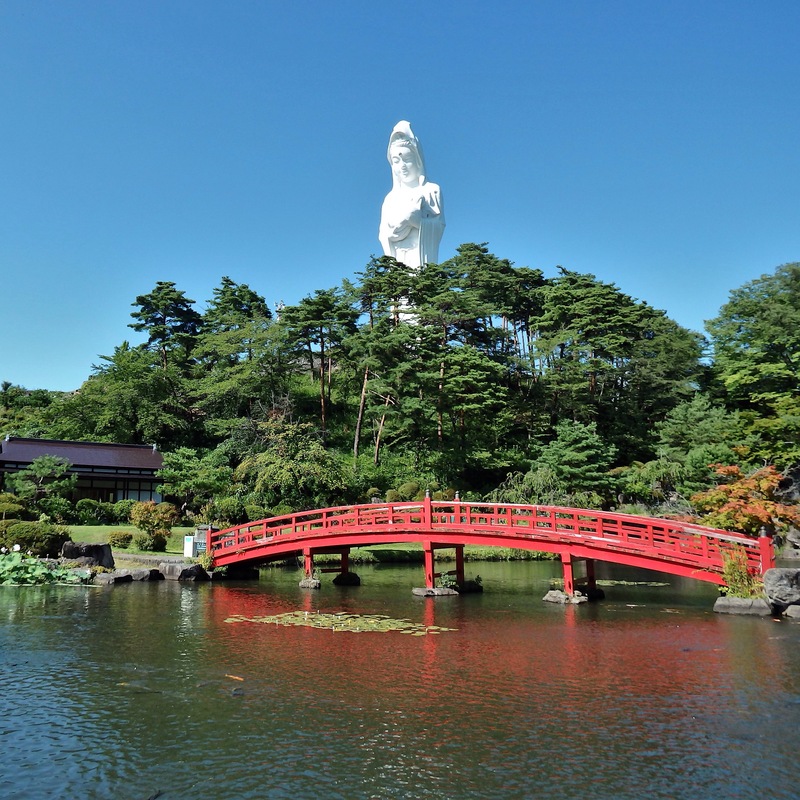 This 57 meter tall (187 feet) ‘mother’ Goddess of Mercy stands over Aizumura – a large garden & park containing walking trails, a small lake, a pagoda, a cafe, and more. The statue was built in 1987 and visitors must walk up 275 steps to reach an observation room in her shoulders. 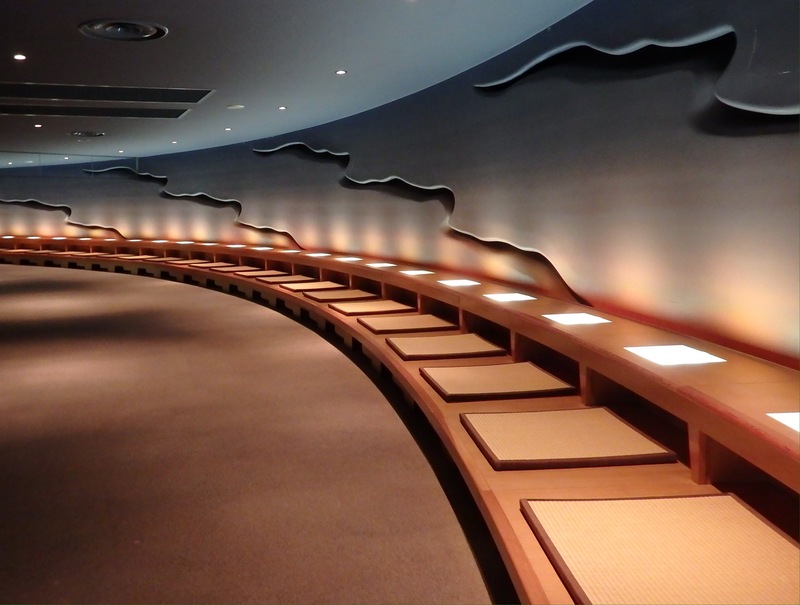 The Aizu Jibo Dai-Kannon is located 22 minutes by bus from Aizu Wakamatsu Station. *For ideas on what else to see & do in Aizu Wakamatsu, check out my article, Aizu Wakamatsu: The Samurai City. The Byakue Dai-Kannon stands within the grounds of Jigen-in Temple, on Kannonyama (Goddess of Mercy Mountain), in Gunma Prefecture. 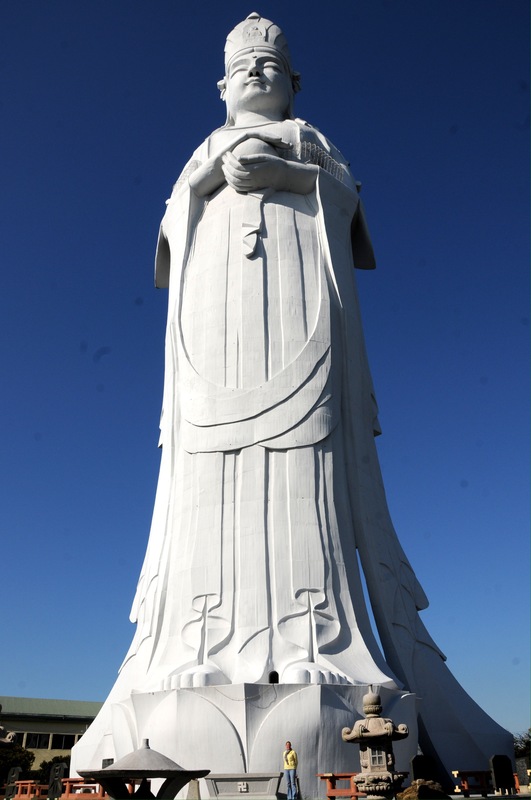 This ‘White Robed Giant Goddess of Mercy’ was built in 1936 and is 42 meters tall (138 feet). Visitors must climb 138 steps, passing a number of small windows and 20 impressive Buddhist statues, to reach the observation windows in her shoulders. Jigen-in is a 20 minutes bus ride from Takasaki Station. 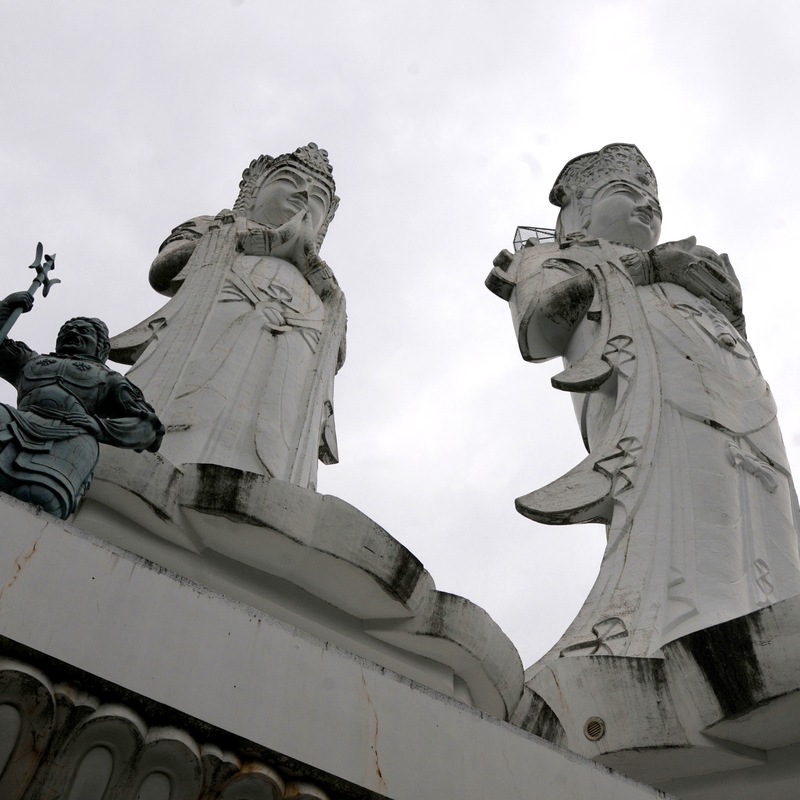 In my list of giant Buddhist statues, the least famous, and most remote, is the Guze Dai-Kannon, a 33 meter tall (108 feet) giant Goddess of Salvation flanked by other large, Buddhist figures. She is part of a complex privately built between 1940 and 1970 on Mt. Hakuun in Hanno City, Saitama Prefecture. 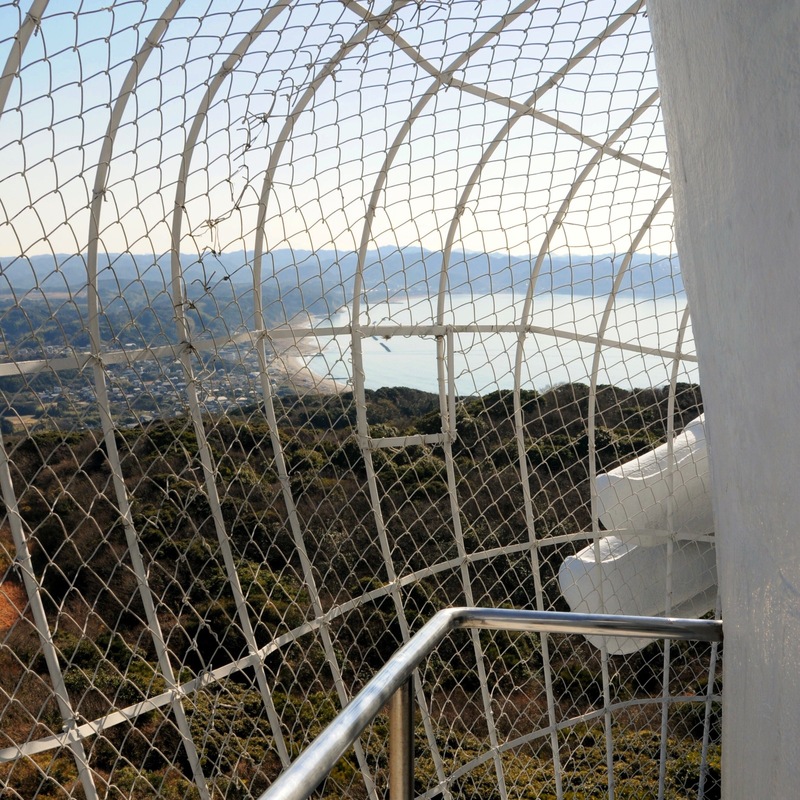 Visitors can only climb her on weekends between April 1st and November 30 to view the surrounding mountains and countryside from a wire cage at the back of her head. Although infrequent and a bit challenging, it is possible to travel here by bus from Hanno Station.